StoreStreams delivers scalable background music service for auto dealers by providing a commercial music service directly to them via internet. StoreStreams combines the power of messaging along with music to provide a special environment to the dealership, that helps connects them to their customers without any extra effort and expenses. StoreStreams offers background music services not only for auto dealerships but for retail outlets, hotels, bars and restaurants as well. 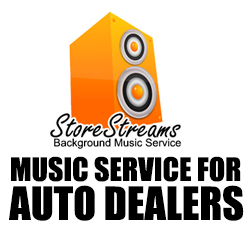 The auto dealer music service provided by StoreStreams is completely scalable and can supply background music and messaging to different areas within the dealership itself. Different music programming or messaging can be played in showroom floor, waiting rooms and in service areas. It does not matter if you have one or thousands of dealerships throughout the country. StoreStreams offers a completely scalable and 100% genuine legal music service for the auto retail industry. • Complete range of in-store audio solutions including amps, playback hardware and speakers etc. • Guaranteed latest music: The auto dealer music service of StoreStreams guarantees to provide the latest music tracks by mega artists of present age. You can choose the music of your choice from daily updated 20 genre stations. You can create perfect vibe for your retail outlet by using custom stations availed by StoreStreams. • Provisioning branded radio: StoreStreams also offers your own custom station to allow you to insert messages to announce special seasonal and limited time offers for the products at your retail outlet. They provide you the talent for conducting recording sessions if you provide them the copy of your program. • Easy hardware and streaming solutions: Simply connect your PA system or speakers to your favorite mobile devices or computer to utilize StoreStreams and play the music of your choice. StoreStreams also offers fully integrated sound system hardware to enjoy background music at your retail outlet. StoreStreams offers 100% legal music services for your business at a very affordable price. You can choose from of our the music service plans below that fits the need to the needs of your business. Retail Radio 24/7 plan: This plan for music service for auto dealers can be availed for $20.00/month with 30 Days Free trial offer. You can use web based listening interface to choose music tracks from 20 non-branded pre-programmed channels. Radio Mixed For You plan: You can avail this plan for $39.99/month with 30 Days free trial offer. It also offers 4 branded read-only messaging custom programmed channels through its web based listening interface. Custom Programming plan: This most popular auto dealer music service plan is available for $49.00/month backed by 30 Days free trial offer. It offers Custom Programmed Channel along with 8 branded read only messages through its web based listening interface. Thus making StoreStreams the best music service for auto dealers at very affordable price.